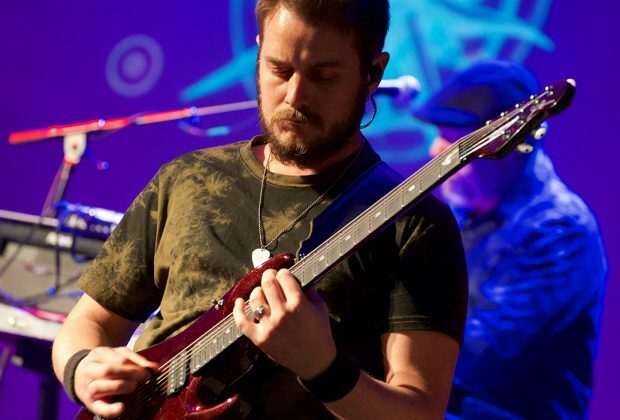 Eric Gillette plays the guitar with surgical authority, and on the surface, it’s easy to draw parallels to his most obvious influence, John Petrucci. 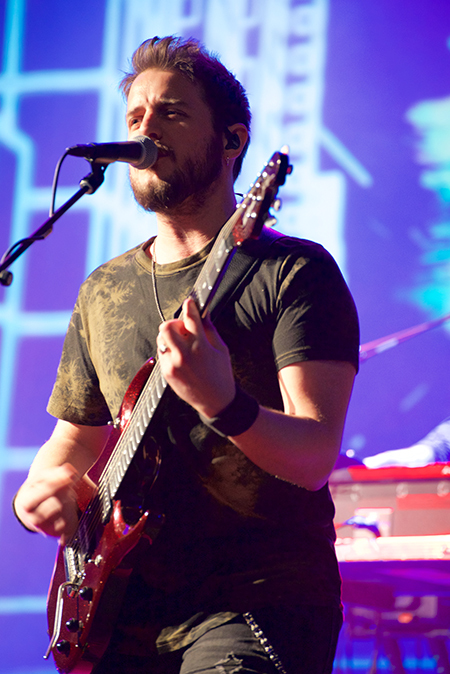 He plays with a similar style and even favors the same great Music Man guitars, but while Petrucci dials up the gain to prog metal levels, Eric favors more classic hard rock tones behind his fluid lead work and classic rhythm work. The fact that this young shredder came from seemingly out of nowhere to deliver such evolved guitar mastery—in such a short period of time—is astounding. We love that he’s completely humble about it, and that he is still on an obvious quest for musical growth. I want to make sure I already know all my parts, because I don’t want to be the only one in the room sitting there, while they’re waiting for me to figure out a guitar lick or something. MPc: You’re not widely known yet to guitarists, so why don’t we start with a brief musical background about yourself and how you came to be in the Neal Morse Band. EG: Oh, let’s see… I started playing keyboard when I was four. I picked up the guitar around 12, and from guitar on, I just kind of slowly picked up other instruments along the way like the drums, even banjo and mandolin. Just pretty much anything that I could get my hands on, I wanted to figure out how to play. I spent a lot of time and hours just practicing in my bedroom in the summers for eight hours a day, just because it’s what I loved, not because of any other reason really. I just had a great time, you know, putting on a Metallica album and trying to figure out the riffs or whatever. I knew it was something I wanted to do for a living. I mean, I’m sure just as any other 16-year-old guitar player would want to play guitar for a living, but trying to figure out how that can become a reality is kind of the hard part. You know, a lot of things have changed, even since when I was younger. I’m not that old—I’m 34, but these days with the Internet and everything... if it wasn’t for the Internet, I probably wouldn’t be where I am right now. Neal held auditions in 2012 or 2013, somewhere around there, for his solo music. He was looking to have a streamlined band, people who could play and sing well, and I just randomly ran across it on social media. As soon as I read it, I was like, “Oh, I have to do that. I at least have to film a couple videos and send them in,” because that was the deal. You sent a video or two... I think it was two. One was pretty lengthy and difficult, and then the other was a short solo, but what I ended up doing was I wanted to... something to set myself apart, and also show that I am a multi-instrumentalist, so I did one song on keyboards and then the other on guitar. And then fast-forward, and started with him in his solo group for a little bit, and then fast-forward a little more. 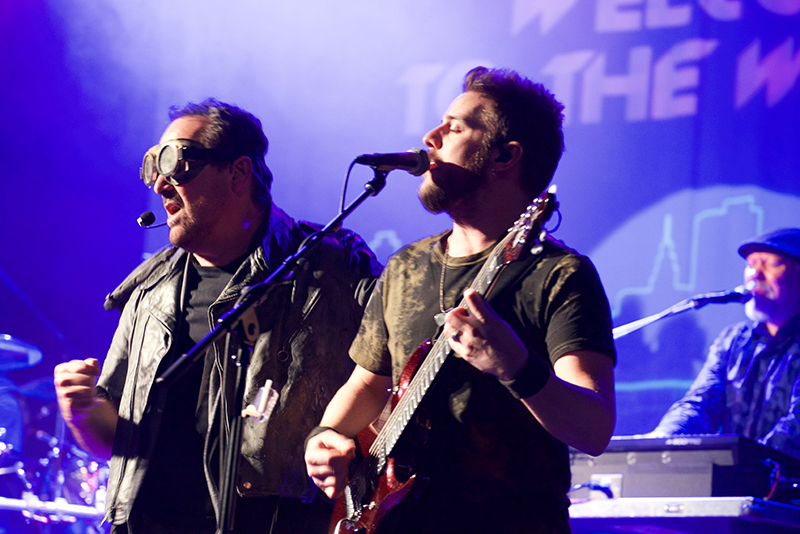 We were playing a lot, I guess, as just his solo music, before the Neal Morse Band was actually formed, formally, as an actual band that wrote and recorded together and all that, but we noticed... Neal and everybody noticed we had a lot of chemistry, obviously, on stage, and wanted to see what it would be like to make this thing a band and actually write, go from the beginning of the process together. That’s when the Grand Experiment album came to be, hence the name, “Grand Experiment,” because we really didn’t know what was going to come of it. I mean, I knew it would be good. I mean, how can you not? You’re in the room with those guys, who are... everyone’s so talented. You can’t help but think something good would come of it. Then, you know, here we are today. 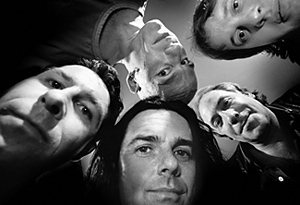 I think with the first album, for me I wanted to kind of feel where I fit into the band the best. You know, like everyone has their strengths and stuff, and for the first album I feel like it was putting the feelers out. I was trying to feel where my strengths were, that I could contribute the best to the band, whether it be writing or guitar playing or singing or all of those things combined. I feel like we’ve all kind of slid into our roles really nicely, and we’re really happy with the music we’ve been able to create together. MPc: Yeah. I bet that it had to be somewhat intimidating, your first time playing with these guys. I mean, not just the skill level, but also they’re all older than you. It’s like stepping into a room with, in some cases, legendary players. Do you remember what was that like? EG: Yeah. It was great, but I think what I’ve always told people is to... if at all possible, if you can figure out how to surround yourself with people that are either more experienced, better than you, or whatever you want to call it, because I feel like that forces you to get better. I definitely never wanted to be the weak link, and that continues on, even when I think about showing up to band rehearsals for tours. I want to make sure I already know all my parts, because I don’t want to be the only one in the room sitting there, while they’re waiting for me to figure out a guitar lick or something. It’s like that, it’s not a competition, but it’s like this healthy... what’s the word? EG: Yeah, and we all... everyone pushes each other to be better. Not that we’re telling each other, “You need to be better,” it’s just kind of this understood thing. You know, everyone is so good at what they do and take it really seriously and bring our best. I think that’s made me a better musician and I’m sure it’s probably made everyone else as better of a musician as possible. MPc: When did you discover progressive rock in your growth? When did you really get into the prog rock thing? EG: Probably not ‘til... well, I can actually pinpoint it exactly. I was super-into Metallica, heavy metal, that sort of thing, and then I think a friend of mine had played me a couple different songs. I remember one was something from Surfing with the Alien. I can’t remember which song, by Joe Satriani, and then the other was “Bad Horsie” by Steve Vai, and I’d never heard the guitar played like that and I was like, “What? What is this?” I found those CDs at the store or something, you know, back when you would go to Barnes & Noble or somewhere and buy a physical CD. I remembered his name and went home and Googled it, and found Scenes from a Memory, that was my first introduction really into the progressive stuff, and what an album, for that to be the first one you discover. That’s when my world was opened to this stuff, and I was hearing these keyboard solos that I didn’t know what it was. I thought maybe it was some sort of weird guitar sound. I figured out it was keyboard and I was like, “What?” All those sort of little things that are... you know, it opened up all these musical possibilities that have inspired me and driven me to where I am today. Mike asked me, and my answer’s always, Yes. MPc: Yeah. So this must have felt like a childhood dream come true, your recent jam on the Cruise to the Edge, playing a Dream Theater set with Jordan Rudess and Mike Portnoy. The problem, the only problem, is you agree to something and then you go, “Oh, crap, I’ve got to learn all this stuff,” but again, that’s what makes you better, because have you to do it. Like ,what am I going to do? Chicken out? No. You’re going to just learn it and bring your best. 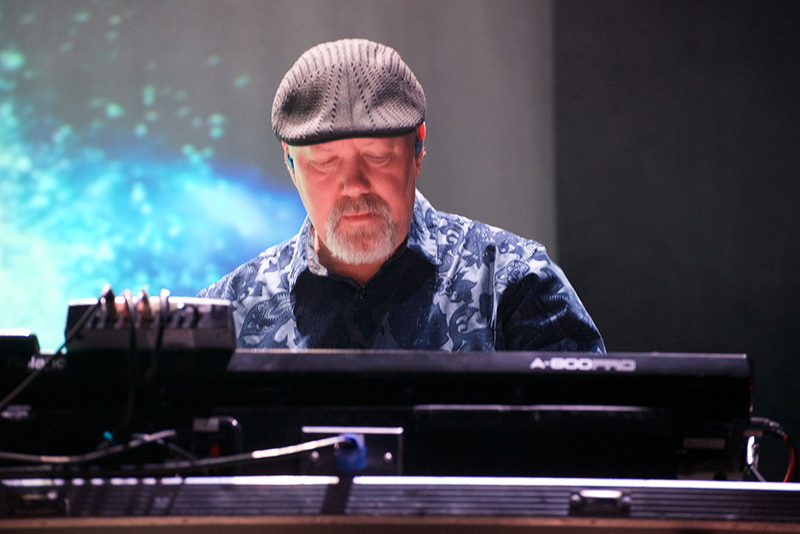 What an amazing experience… because going back to Scenes from a Memory, once I discovered all that and found out, who’s this keyboard player, Jordan [Rudess], and then became a massive fan. I mean, that’s why I bought and own a Kurzweil K2500, because I saw on Live Scenes that he was playing that. I was, like, “I’ve got to figure out how to do what he’s doing,” which is nearly impossible. I mean, to get to play that with those two guys, what a special moment. They were finally playing together again after, I don’t know, nine or ten years or something. What a just nice, humble guy, just to get to chat with him and become friends. It’s insane, so I don’t take any of these moments for granted. They’re very special, and yeah, it’s crazy when I think about it. MPc: Nice. Now let’s just talk about your gear a little bit. It’s obvious that once you discovered the seven-string, as well as John Petrucci, it forever altered your path with guitars, as it seems I’ve never seen you without a Music Man JP seven-string. EG: Yeah. To be honest, I entered a guitar competition when I was 18 called Guitarmageddon. It was put on by Guitar Center, and I placed in the top seven nationally. What the prize was, if you made it to the top seven—which there were all these rounds, like regionals and locals and all this—and then we went through to Vegas for the finals. If you placed in the top seven, you got to pick from an Ernie Ball catalog and build any guitar you wanted. There was no limit. They just gave you the book. At that point I was fresh on the Dream Theater train and I saw the Petrucci model, and I was, like, “I’ve got to get it.” My main reasoning for decking it out was just because I could. I didn’t have to pay for it, so I added whatever made it the most expensive, because I knew at that point I couldn’t buy my own. I got the seven-string. You know, I just clicked Add on every feature. I wanted the Mystic Dream paint job. That’s the most expensive one. I just decked it out because,I figured it was a prize and why not? At that point I had no idea how to play a seven-string and, yeah, it was quite a shift. Once I got the guitar, I just fell in love with Music Man. It’s just such a quality instrument. And the Petrucci model just has everything I’m looking for. It’s very versatile. It’s got a great, super-heavy sound, a great clean sound. I can basically get any sound I want out of it, which is what I’m looking for. Also in the Music Man line, I’m a Music Man Artist now, which is also crazy to think about, them being my favorite guitars and all that. The Petrucci model is the only model that I’m aware of in their line that has 24 frets, and I utilize that a lot. I mean, who knows? Maybe in the future, it’ll be wild enough to think about, but maybe at some point I could do some sort of custom build with them or something. In the meantime, it’s the perfect instrument for me. I looked at other models, but like I said, there’s a lot of stuff I do up on the 24th fret, even bending beyond that a whole step, and I kind of need that for a lot of stuff. But like I said, I love what they do and how they’re a good company. 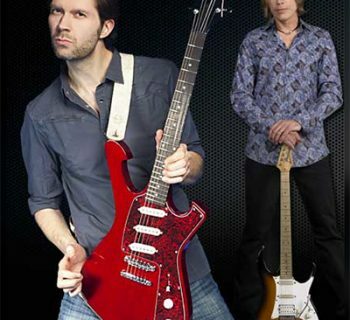 MPc: Which version of the Petrucci guitars do you use primarily? EG: I have a JP7. That’s the original one that I told you I ordered when I won that, or placed in the top seven. Then the one I have currently that is my main is a JP12 seven-string, with the Piezo pickup. It’s fantastic. It plays so easy. I don’t have to worry about the instrument, I just have to worry about my playing. I don’t know, it makes life easy. MPc: Yeah. You’re preaching to the choir. My main guitars is my JP11. [laughs] Do you make use of the Piezo acoustic in the Neal Morse Band? EG: I have, but on this tour I’m actually not. I’m using just the middle position with the split position on the clean sound, and it gives a really good... anytime I’m needing to replicate some sort of strumming, sort of acoustic sound, it does pretty well. 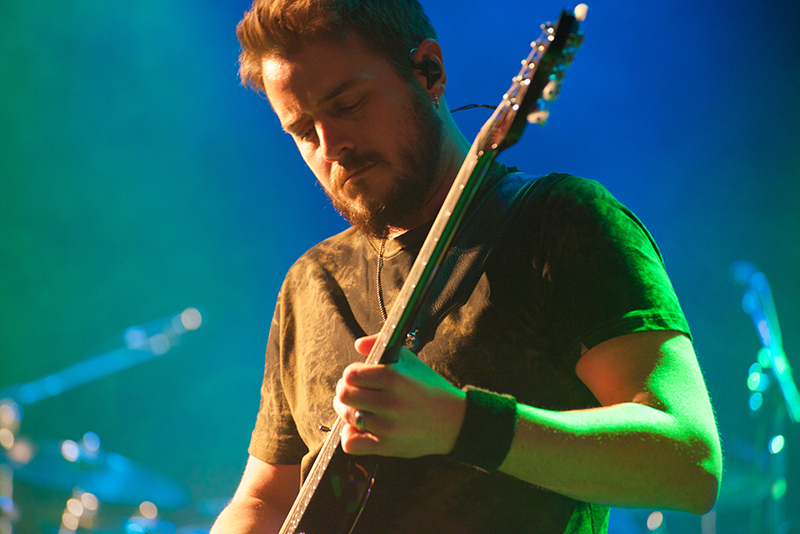 I have in the past, even going back a few years, I had a splitter box where I would run and split them out separately [the acoustic and magnetic tones], but Neal’s actually playing a lot of the acoustic parts on the actual acoustic, so it’s not a lot of need. I have it running, where if I do need to switch to it or want to, I can, but I tend to just use the middle clean split position. MPc: Let’s talk about the rest of your tone. I notice somewhere along the line lately you made a switch over to an Axe-Fx, so tell me about your travels through amps and modeling and how you make your sound. EG: While I was using real amps, a real pedalboard, lots of fun toys, Memory Man delays and a lot of that fun stuff, the issue I kind of ran into at the level where I was, you’re backlining stuff at these shows... it’s a little bit different when you’re doing a full bus tour, because you can backline a specific amp and bring it on the trailer and it’s with you for the whole tour, hopefully. There’s been a lot of situations where we do either one-offs or fly dates, and you fly to somewhere like Israel. You put this stuff in the rider, what amps. You usually put what amps you want and then you put a backup if they can’t find that, something similar. Sometimes when you go to places like that, it’s a complete crapshoot. You have no idea, and you show up and it’s like some Crate amp I’ve never heard of. It’s kind of a bummer, because you can’t get that sound you want. It’s kind of uninspiring. You know how it is, playing with a tone that’s not quite what you’re used to or what you want. I had that happen a lot, and I didn’t really know what the solution was for that until I ran across the Axe-Fx. I’m trying to remember. I mean, I know I had seen it in people’s rigs that I follow. I know Petrucci had used it for a while, mainly just for effects and all that, so I knew the effects were great. Then at some point, I got in contact with Fractal and got an Axe-Fx II XL, the rack, and was just blown away. I mean, not just blown away by everything about it, but what I really, really loved was the consistency night after night. I mean, literally my sound would be the exact same every night. That was a big deal, especially being on in-ears. Everyone but Neal uses in-ear monitors, and we travel with our front-of-house console, so all the mixes, they run our mixes from the front-of-house console, so they’re all saved. Once you get dialed in—the first few shows can be kind of rough, but once you get dialed in, you just walk into sound check and you put your ears in, and it’s 98% there. That’s a big deal, because if I was using a different amp or a different mic, there would probably be a lot of tweaking I would need to do. So I just got rid of it and at that point they came out with the AX8, which I was super-interested in as far as downsizing the rig for travel to make it really easy, because at that point I had to bring my Axe-Fx in a roll-on carry bag with my Matrix power amp, and bring it on the airplane. At every airport, they gave me crap about it and they wanted to make me check it, so it just kind of became a big deal. It’s an extra piece of luggage, because I still have to bring my pedalboard with the controller and all that. When I went to the AX8, it basically took the rack out of the equation. Now I have everything in one pedalboard case. I’m running a Mission volume or expression pedal as a volume control, and then I have a JP wah that I really, really love and then a wireless unit, and that’s pretty much it. It’s super-simple. As far as my sound, I have a lot of people ask, and I think people kind of want it to be more in depth than it really is, but to be honest with you, I probably 90% of the time use the Friedman amp model. It’s the one. I’ve tried all of them. I just gravitate towards that one the most. They have the Friedman HBE 1 and 2, I think. There’s quite a few now. They’ve actually expanded. There’s a Friedman 2018, I think, that I’m currently using mostly for all of my high-gain. Sometimes I’ll use it and roll the gain way back for a little less. If I’m going to do a clean sound, I’m usually using a Deluxe Verb or a Super Verb, and that’s pretty much it. Occasionally I’ll use a BBE preamp as a little bit of extra drive before the amp, but probably 80% of the time I’m not using a drive pedal before it. Then various delays, and I have a volume boost I use when I’m doing solos and that sort of thing, but that’s pretty much it. It’s the Friedman. I’m not sure which cab. Sometimes I have to adjust the cab, depending on the sound I’m looking for. 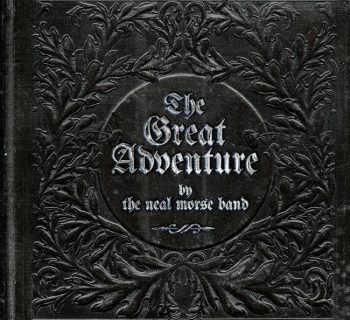 MPc: What about recording The Great Adventure? Did you record with Axe-Fx, or did you record with a traditional amp setup? EG: I recorded with Axe-Fx. The past two albums have been Axe-Fx, yeah. MPc: Oh, so you’re all in, every which way. EG: Oh, yeah. Absolutely. I love their products. I mean, I’m to the point where I have the sounds I want, and it’s just really easy to dial it in and start recording. I’m not saying I’ll never use an amp. I have a Mesa Lone Star that I really love that’s set up and ready to go in my studio and some other stuff, but I’m so used to it. I’ve got it dialed the way I want it. For me it’s the easiest and the quickest. When I’m feeling inspired and ready to do something, I want to be able to quickly get into it before I lose that inspiration. MPc: Yeah. What in-ear monitors did you end up choosing for yourself? EG: I got the JH Audio Pro 16 V2. There’s 10 drivers, so it’s quad low, quad high, dual mid. Yeah, I just got those before... I guess it was before the last tour, and I’ve really enjoyed them. They’re really great. I think Bill just got a pair too, and he just got them for this tour and he’s really loving them, too. That’s what Mike uses, so a lot of us are using JH Audio. MPc: Cool. 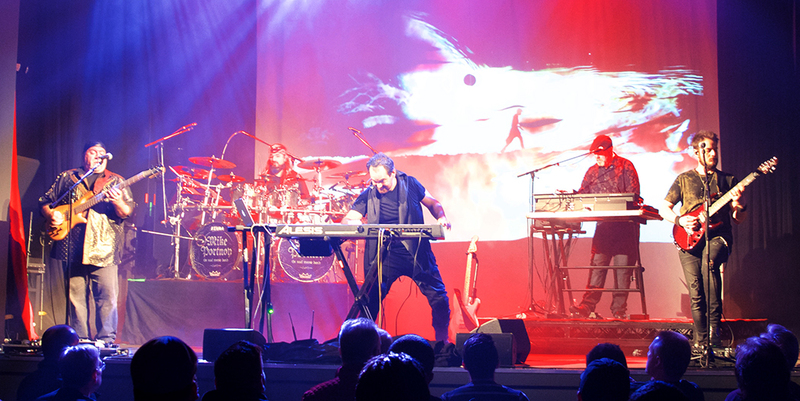 So tell me, what do you think is most challenging in the Neal Morse Band: nailing your guitar parts or nailing the vocal parts? EG: Probably I’d say both, because there’s moments where they overlap. That can be the tricky part... sometimes there’s a big guitar run that ends on a note that is the big high note of the vocals, so sometimes those are... it’s easy, or it can be easier, to do one or the other by themselves, but when you try to do them together, it can be an issue. That’s just where the whole rehearsing comes in handy, you know, like getting that all dialed in before tour. A lot of that becomes muscle memory, because sometimes I’ll do a big run, have to switch a patch and hit the high note almost all at the same time, so it’s kind of like a dance move. You have to remember where your foot needs to go, where your hands need to go and what note you need to sing at the same time, so I guess I would say both. MPc: It might be interesting to get Bill to program your patch changes and just send it out over MIDI to your Axe-Fx. EG: I know he can do it. He’s done some crazy stuff I’m sure he told you about, even with programming. MPc: Yes. That’s why I was thinking about that, because I was just on the phone with him earlier today. We were talking about some of the custom programming that he’s done for his stuff. EG: Yeah, it’s pretty wild. In other situations, what you would do is... we don’t play to a click, but a lot of people do, and you could actually just have your patch changes programmed in its own little MIDI lane and have that sent, so that would be great, but we don’t really play with a click track. There’s a lot of stuff we do that we like to be a little more free on. MPc: Yeah. Well, it’s not like Mike isn’t a human metronome anyway. [laughs] I understand a couple of years ago you put out a solo record. EG: Yeah, it was my second one, back in I guess 2016. It’s been a while now. I put out my first one, called Afterthought, I believe in 2013, and that’s kind of a collection of some songs I had demoed and written going years back, and never had a chance to really do anything with them. Then I wrote a lot of new pieces, one being a really, really long... 27-minute song or something, called “Lost.” That was like my big prog epic, the first one I’ve ever written that I wanted to do. I took that out with me on Neal’s solo tour. That was in I guess 2013 or ‘14, and then in 2015 I released The Great Unknown. That album is probably a little more on the heavier side. I’m a fan of heavy music. Not that it doesn’t have its down moments, but it probably leans a little heavier on the seven-string and that sort of stuff. Then I have Thomas Lang on drums, who’s a monster, Diego Tejeida from Haken on keys, also a ridiculous player, and Conner Green from Haken on bass. The musicians on there are just incredible, and I’m really happy with it and hoping to do something maybe the end of this year. I won’t even be home until probably beginning of May, but I’m hoping around then, maybe in the early summer, I can start studying on writing. I can do some writing remotely. I have a little remote rig I bring, but you never have as much time to do that stuff on tour as you think you will. Even on days off, sometimes you finally have a day off in a hotel and all you really want to do is relax. Yeah, I’ve got a few things in the works, hopefully they can start coming to fruition in the end of the year. I’ve got a lot of stuff coming up end of this year into next year that I’m excited about, a lot of possibilities. There’s going to be a lot of music to come in the future, and I’d love it if I could share it with any new followers that come along.